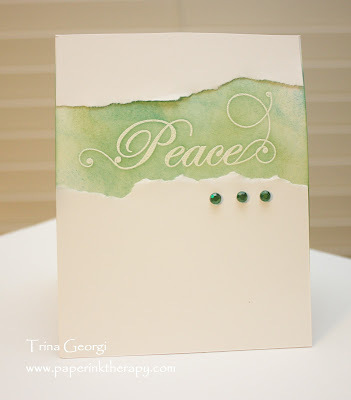 I heat embossed the sentiment with white embossing powder, then went over it with Peeled Paint and Broken China distress inks, tore some paper, and added rhinestones...very easy and very fast to make...I like! LOVE that torn paper and the beautiful background!!! So glad you played along with us in this week's CAS(E) this Sketch! Love your card, so elegant and creative! Oh my gorgeous!! I love the torn layer peeking from underneath and those soft, swirly colors are gorgeous! Thanks so much for playing along with us at CAS-ual Fridays this week! That is so lovely, what a beautiful sentiment, and your sponging looks great. Glad you didn't quit on this because it's gorgeous!! Thanks for playing along with CAS(E) This Sketch! this week! Gorgeous card- I love that background! Thanks for playing along with this week's CAS(E) this Sketch! This is really beautiful, love how you used the torn edges here!! !